If you’re allergic to endless slogs on the treadmill, the latest fitness trend — doing choreographed strength-training moves mixed in with cardio bursts — might inspire you stop using that ubiquitous piece of equipment as a towel rack and start working out on it again. 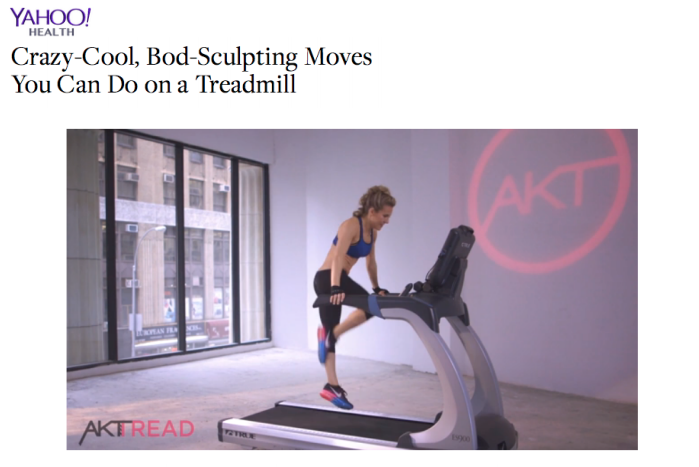 Recently, fitness personality Astrid Swan posted this Instagram video of an innovative ab-and-arm exercise using the belt of a treadmill. Start walking on the treadmill at 3.5 mph with hands gripping on each handlebar. Lift your body into the air by putting all your weight on your arms, and straightening them completely. At the same time, move your legs in a running motion in the air, lifting knees as high as you can to your chest. Set your feet back down, take one step on the moving treadmill, and repeat the slow, controlled jumping motion with the opposite leg in front. Repeat this movement for 60 seconds. Turn off the treadmill and stand centered. Using your arms for support, sit back into a squat position, crossing your right leg underneath your left. Stand back up to center, lifting your right leg up so your foot is against the left knee. Repeat 10 times on this side; switch sides and do 10 more reps.
With the machine switched off, put your arms on the front part of the treadmill with legs out behind you in a plank position. Then, slowly start running with your legs, moving the belt manually. If you start to speed up too fast, slow down your running to a more controlled, deliberate movement. Keep your tummy tight into your belly button, and be careful not to arch your lower back. Do this for 60 seconds. With the treadmill switched off, sit underneath the handlebars at the top of the belt, and reach arms up to hold on. Bend knees and place your feet flat in front of you, shoulder-width apart. Using just your arms and abs, pull your entire body up toward the handlebars. Keep your tummy tight and be careful not to arch your back. Slowly lower back down the sitting position, controlling the movement completely with your arms. Do 10 full pullups. Given what a versatile, fat-melting, muscle-sculpting piece of machinery the treadmill can be, we may have to start calling it a shredmill.